A nourishing keto meal that is ridiculously simple to bake and tastes incredibly amazing too? Beef taco pie, that’s what we are talking about today. If you have never tried it before, get on it, because time passes too quickly to not enjoy the flavors that are packed into this mouthwatering pie. And the crust? One would hardly believe how amazing a gluten-free crust could (and should!) taste. Before you get started, it is also good to know, that this meal is completely child-friendly. Serve it with a side of fresh sliced carrots, celery and cucumber, and everyone will be over the moon – not to mention that they will get plenty of vegetables too. The cheese gives it an extra kick of awesomeness, but if you are dairy-free, go ahead and try one of your favorite alternatives instead, or fully omit it. No taco, or taco pie, is complete without a generous spoonful of homemade fiery salsa. Of course, the level of heat is dependent on how much you add of the jalapeño peppers. If it gets to be hotter than you can handle, you can always build up with some Paleo sour cream on top. And be sure to have some fresh guacamole on hand, after all, avocados are likely to be a staple in your kitchen, so use them when they are good and ready – there is nothing better in the world than eating them with tacos! Place almond flour, coconut flour, tapioca starch and salt in food processor and pulse briefly. Add coconut oil or ghee and egg, pulse gently until the mixture forms a ball. Place the dough into a 9 inch glass pie dish and press all the way to the edges, make holes with a fork on the base of the dough. Bake in the preheated oven 12 to 15 minutes. Melt cooking fat in a skillet over medium-high heat and cook garlic and onion 1 to 2 minutes. Add the ground beef and cook until browned, 5 to 6 minutes. Sprinkle the chili powder, paprika and cumin over the meat; season to taste. Top the pie crust with the ground beef and shredded cheese. Place in the oven and bake 12 to 15 minutes. 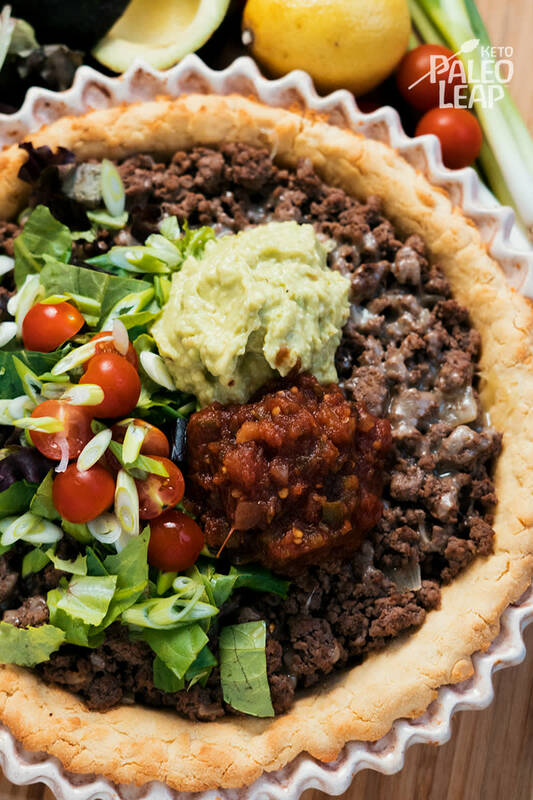 Serve the pie topped with bell pepper, green onion, lettuce, tomato, fresh salsa, and guacamole.